Each month at work there is a theme. This month's theme is 'The Look of Love' and to help get everyone into the theme, Kirsty asked the girls in the fabric shop to each fill an embroidery hoop using the theme. We were free to use whatever technique, fabrics and methods that we wanted. I needed something that would look effective, but come together really quickly. 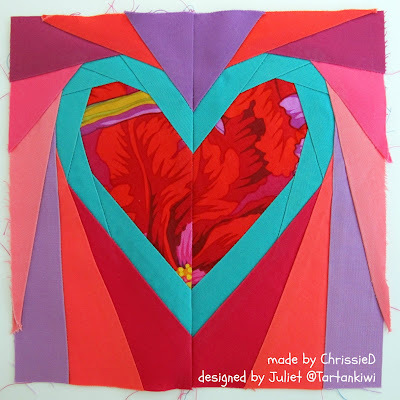 I put my thinking cap on and designed a simple paper pieced heart pattern. This is the easiest pattern that I have designed so far. Now when it came to fabric choices, I had fun. I know that traditional colours for hearts are pretty pinks and reds, but Valentines is about couples and let me tell you- Mr Tartankiwi would NOT be at all impressed by pink and pretty! I decided that the heart was pretty enough and went with more masculine colours- grey, green and teal. Mr Tartankiwi LOVES it and had no hesitation in saying that he'd hang it on the wall. I am really pleased that I went with non-traditional colours. I guess I could have embroidered some text on the block- "Love" or something like that, but again I don't think this it was needed and I prefer to keep the lines clean. The thing that I am least happy about is the quilting. 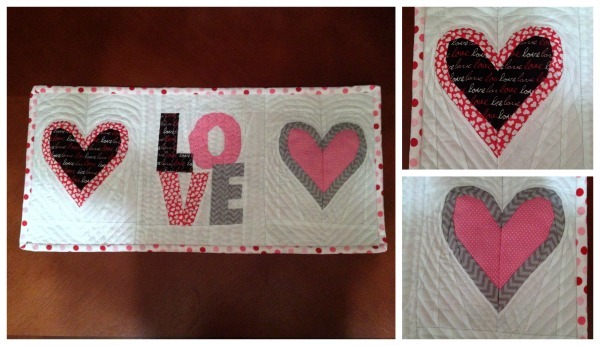 Perhaps I should have gone bolder and used contrasting thread or I should have done more prolific quilting. Hmmm not sure what I should have done but if this was a school report card, the quilting section would read "could do better!" This was the first time that I have quilted anything for an embroidery hoop. I love the way it turned out and I am especially pleased with the way that I finished the back off (I used this tutorial). My pattern testers have been beavering away behind the scenes for me and as a result I am able to offer you yet another free pattern. 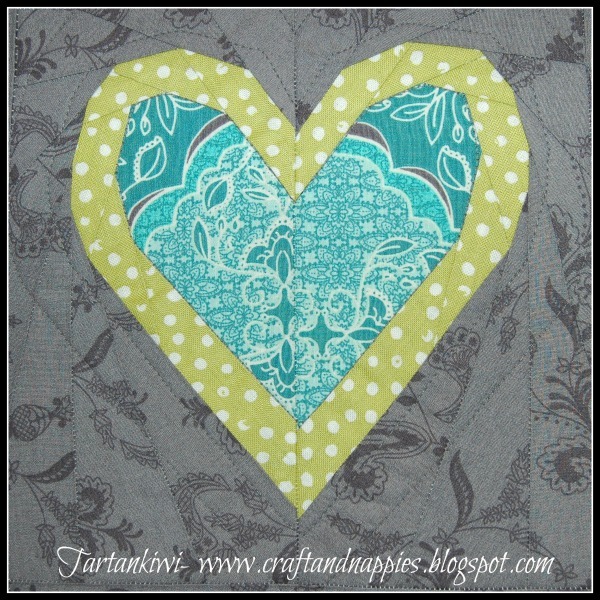 You can download the concentric hearts pattern here. To get those creative juices flowing, just have a look what my pattern testers came up with. Thanks Girls, you did a great job as usual! I love how each of them has come up with their own unique interpretation of the block. Not only did Angela produce a block. but she produced a completed project! Just look at her awesome table runner! I just love the way she used those grey chevrons. This is ChrissieD's take on the block- awesome as always! And just for luck, a third pattern tester! Don't you love the vibrant red that Carin used! So now that we've shown you a few different ways that this pattern can be used- what are you waiting for? 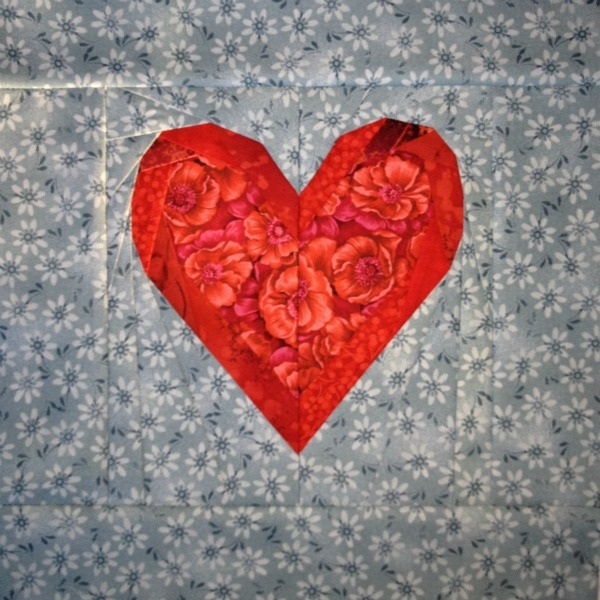 Why not download the concentric heart pattern now?! Love the colour combo! And I was about to say I liked the simple quilting too, but after reading on, I guess I see what you mean :) But Hey I like it! Lots of possibilities for incorporating this into projects. Great colour choices... a refreshing change! Love it! 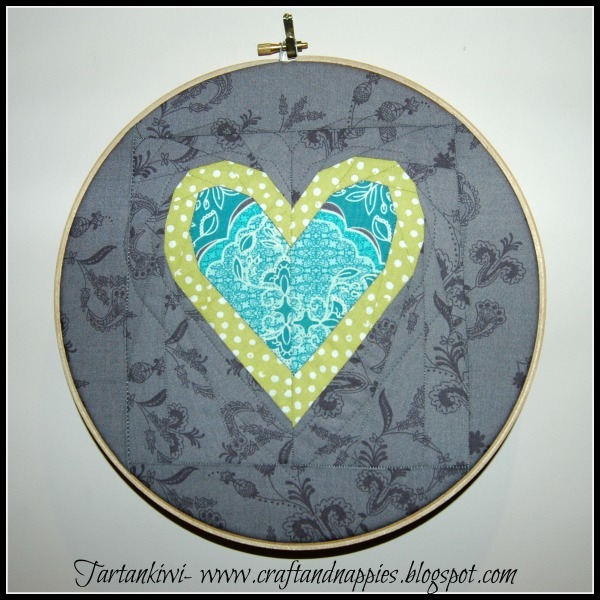 Beautiful new pattern and your embroidery hoop is just gorgeous! looks awesome - I've been meaning to do a hoop too - when does it close? Awesome block, hoop and colours Juliet! I hadn't come across that technique for finishing a back before! Very interesting! Also love the tester blocks - specially the table runner! Popping over from Quilt Story. All of the hearts are so cute - and what a neat idea to have a theme of the month at work! Thank you very much for a really attractive pattern, really good for my first attempts too.